At 10, Annette Morris yearned for a bicycle. Her mother told her she needed to earn the money to pay for it, so she got a paper route. That same drive and ingenuity propelled her to establish a small business in Laguna Beach. Her mother figures in this decision, too. 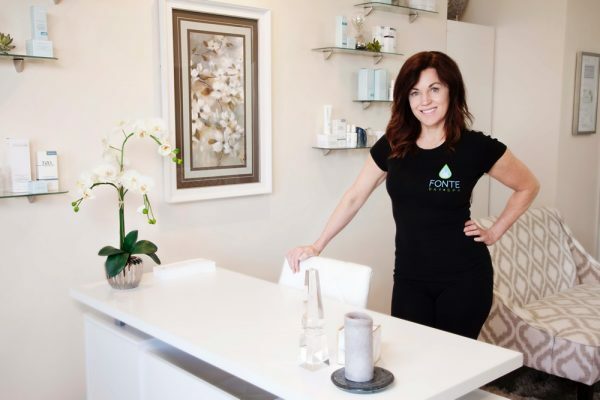 After 17 years working as an esthetician, Morris recently opened Fonte Day Spa in a medical building just south of Mission Hospital. The spa offers the standard services such as facials, massages and waxing and, if one is inclined to ask, some friendly, free advice about diet and its effects on the appearance of one’s skin. With the benefit of business school training, Morris went above and beyond a lender’s application requirements when seeking a loan to open the spa. She supplemented her business plan with a survey of which services bring in the most revenue and pie charts. “I think it definitely helped,” she said. Annette Morris in her new digs. Other innovations figure in her business plan, too. Fonte offers a “spa party.” Held at the spa or in a client’s home, Morris and her colleague provides treatments to groups, such as get-togethers watching television’s “The Bachelor” or birthday and special occasion celebrations. Kim Ward, also a licensed esthetician, works alongside Morris in the new spa, decorated with tan and white furniture and fuzzy rugs. Specialists provide Botox and brow enhancement treatments as well. Day spas are licensed by the California State Board of Barbering and Cosmetology and operators must obtain a city business license, but neither the Chamber of Commerce nor the city track the volume of spa businesses. Currently there are at least 13 other day spas in Laguna Beach, plus a handful more that cater to guests at the resorts. Anecdotally, a least, many are not long-lived. Still Morris feels confident her business will thrive, which is her top goal. “I have clients who have followed me for seven years,” said, Morris, who has also earned certifications in massage therapy and personal fitness training. Gloria Milks believes that her daughter’s keen interest in fitness stems from watching her battle to keep the pounds off. Morris made her mother’s meals, weighed her in each morning, doled out vitamins and accompanied her on walks. “She ended up losing 60 pounds,” Morris said. Nutrition, that passion of her teen years, became her minor while studying business at Palomar College in San Marcos. At age 26, though, Morris found herself a divorced single mother of two year-old twins. Without alimony or child-support and her bank account emptied, she sought help from her brother, Jim Milks, who invited her to move into his Laguna Niguel condo temporarily. He helped care for his niece and nephew while she worked nights as a waitress. Morris continued her education, pursuing online a dual bachelor’s degree in business management and administration from the University of Phoenix and later graduating in 1999 from the Palomar Institute of Cosmetology. Working as an esthetician and establishing her own schedule permitted the flexibility she needed as a single mother. One of Morris’ favorite jobs was at The Golden Door, in Escondido, a luxury retreat popular with celebrities. She moved to Laguna Beach in 2010 and worked for a time at the Art of Fitness, a gym on Coast Highway. Her brother, who worked with Morris in the family owned bakery in the early ‘90s, is not surprised by her success. “Annette is an entrepreneur at heart. When she worked for others she worked hard, as if she was the owner of the business,” said Milks.